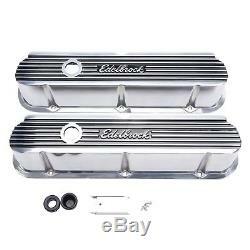 Edelbrock 4264 Elite II Series Valve Cover. Elite II Series Valve Cover. Elite II Series Valve Cover; Tall Profile 3.7 in. WARNING CA Proposition 65: Yes. WARNING CA Proposition 65 Message: WARNING: This product can expose you to Lead; which is known to the State of California to cause cancer or birth defects or other reproductive harm. This new line of accessories features a design that is influenced by the original Elite Series originally released in 1985, but with a new modern take on this classic look. They're made from heavy-gauge, die-cast aluminum and are finished off with a show quality high luster polished finish. The raised fins are accented by a contrast gloss black finish between the fins for the definitive Elite Series look. Our tall profile valve covers are 2 taller than stock, and clear most roller rockers and valvetrain components. Our low profile valve covers clear all air-conditioning, alternator brackets and aluminum rockers. Overall height is measured from gasket flange to top at the highest point. Elite II Series Valve Covers are available in Polished Finish ONLY! #4275 and #4277 are designed to clear most roller rockers on factory cast iron and Edelbrock cylinder heads. They may also interfere with some factory accessory brackets and power brake boosters. #4276 is designed to clear most roller rockers on factory cast iron and Edelbrock heads. When you design and sell the best-engineered performance products in the world, you have to have a rigorous testing program. Without adequate testing, there's no way to stand behind your product with confidence. That's why every product we design and sell at Edelbrock is tested and approved by Edelbrock engineers in a real world environment on state-of-the-art equipment. Our three Super Flow computerized engine dynos are capable of measuring 11 separate engine variables up to speeds of 12,000 rpm. For 2007, we added a new Super Flow SF902 engine dyno. It's fully automated and programmable to simulate various driving situations, and is equipped with WinDyn software for the very latest in testing equipment. For real-world tuning, there's our Super Flow model SF-840 eddy-current chassis dyno that can handle up to 1,000 hp at the wheels and speeds of 200 mph. When all testing is completed, the results evaluated, and the part has passed all performance criteria, then, and only then, is the product deemed ready for production. These precise testing procedures are applied to the entire Edelbrock line for performance that's guaranteed. Edelbrock test vehicles are driven by Edelbrock engineers and employees to get a "real world" feeling for the performance improvements. Our products are also tested and used by professional race car teams and drivers. Working with these talented individuals is just another extension of our research and development process so when we say "proven performance" we really mean it! Top racing teams in all forms of motorsports rely on Edelbrock to produce parts that they can count on to win races and championships. Starting from a small garage in the 50's to the beautiful new 6000sq ft showroom we have today, customer service has always been a top priority. We can only process Domestic credit cards. Which carrier is used depends on your location. We will choose the carrier that will deliver the quickest for your location. We can not and will not declare an item as a gift. This listing is currently undergoing maintenance, we apologise for any inconvenience caused. The item "Edelbrock 4264 Elite II Series Valve Cover" is in sale since Sunday, February 1, 2015. This item is in the category "eBay Motors\Parts & Accessories\Car & Truck Parts\Engines & Components\Valve Covers". The seller is "espeedshop" and is located in Lindenhurst, New York. This item can be shipped worldwide.